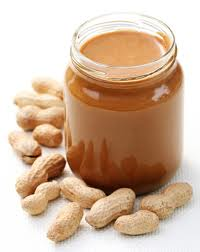 Pink Cherub Moon: 30 Days of Giving Thanks-November 15-Peanut Butter! 30 Days of Giving Thanks-November 15-Peanut Butter! November 15 - Today I am thankful for - PEANUT BUTTER! I love peanut butter! It's quite a versatile food! You can cook with it, bake with it, dip stuff in it, you can even eat it straight from the jar! You can eat it on toast for breakfast, as a sandwich for lunch or dinner, bake it into cookies for dessert, but my favorite way to eat peanut butter is to put it on apples, bananas or celery. What a fantastic snack! It's an easy way to get fruit, protein, carbs and fat all at once and within reasonable levels! It's a great way to get in a few food groups, although I still beg to differ with Jim when he says that M&M's aren't a good lunch, but that was another post. 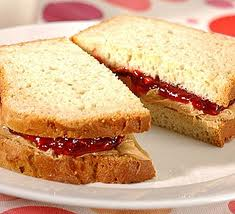 If I eat a good old-fashioned PB&J sandwich, it has to be with real fruit strawberry jam. OK, sometimes pumpkin butter, but nothing else! No grape jelly because it just sits there wiggling and won't spread over the bread like jam does. Jim likes "fluffer-nutter" sandwiches, which is peanut butter and that marshmallow goo that comes in a jar. No thank you. When I was growing up, a kid next door ate peanut butter with mayonnaise sandwiches! That's one of those visions I will never get out of my head! Can you say BLECH? Nope, give me my strawberry jam and I'm a happy camper. Oh! It has to be smooth peanut butter too; none of that crunchy kind. My mom gave me some of that, unbeknownst to me, when I was in school. I bit into it and thought my teeth were falling out! My grandma always sprinkled sugar on her peanut butter sandwich. She said it kept it from sticking to the roof of her mouth! I'm not exactly sure who first came up with the idea of peanut butter. I know there's that little song, something about a peanut sitting on a railroad track, along came a train and woot woot! peanut butter, but I don't think that it's really made by squishing peanuts on train tracks. I imagine that there's something more technologically savvy by now. 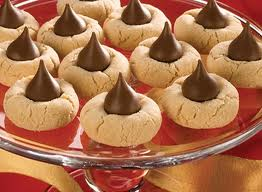 My absolute favorite cookies to make, especially for Christmas, are Peanut Butter Kiss cookies. My mom taught me how to bake them when I was younger and I've loved them ever since! While the recipe on the link isn't hers, I imagine it's pretty similar. So, that's why I'm thankful for peanut butter! Now I need to go to the store and buy some as I've made myself hungry looking at all of these pictures and don't have any in the house!